I enjoy watching makeovers. It could be a home transformation when the designers come in and paint, recover furniture and add those special touches. Or I've seen face makeovers where a makeup artist will apply cosmetics and the person looks so different. But something that's been hitting me lately is that I don't need to do a makeover on me. Jesus has already done the work. I didn't need to clean up my mess first. He did it for me. I received this cartoon from Joyful 'toons today. 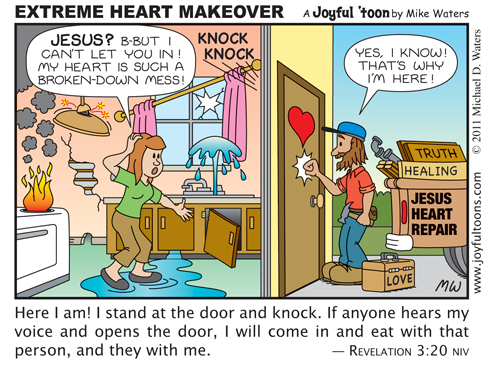 I think it's such a great illustration for extreme heart makeover. Yesterday I received Pastor George Stroh's commentary which seemed to go right along with this message. He writes about how we are made brand new in Christ. Many believers tend to forget who they are in Christ. We've had an extreme heart makeover. Now we need to live out what we believe. How do I do this? I walk by faith and obey His Word. When I surrender and pray about the challenges I'm dealing with in my life, I invite God to work in my life. I may not see immediate results but I trust Him. I want to walk by faith and trust. So, I've been reading Hebrews again. I thought I would end this post with the video of Jason Gray singing "I Am New". Listen to the words carefully. I often feel that way too, that I need to get my act together first, then God can use me. But as you say, the work has already been done! How is your Mother in Law? Debbie~ I love your cartoons! They always make a post point special. Thanks for always sharing from your sweet heart. I pray for you often, and see the Lord glorified through you as you walk out where He has you right now. Taking a break with my family but I read your comment on my site and I'm so thankful your MIL is doing well! Praying still for her continued healing and full recovery. I can't imagine what you felt when you smelled the antiseptic whiff from the hospital :)...But one thing is for sure, whether we become rusty with some skills, they would never go away. I know now that those skills get used if the Lord wants us to in a specific place. I'm glad I came by and was reminded the most beautiful makeover I had years ago, as I look in the mirror and know how fast I'm approaching to become 100 :), all I can do is smile knowing that I may remain joyful and feel beautiful deep inside forever. Thanks be to the Lord. I look around me especially at workplace and see so many beautiful people but I often wonder how beautiful the inside is...With the actions shown, it is sad to me that I know it could be a mess that they're dealing with deep inside. I pray many more will open their hearts' doors to Jesus. I love that cartoon. The video was taking time to load as I have a low signal where I am but I know you always share awesome songs and because of your reminder, my heart is singing anyway. May you remain strong in the Lord's mighty power. May God's richest blessings pour on you. Ooopppss...It did...The extreme makeover. Blessings and love to you sister Debbie. I love makeover shows, too! Currently I'm a "DIY Network" junkie!! I love to see how disasters of a house or yard are changed to something beautiful. However, the transformation that Jesus makes in our hearts is so much more beautiful! In fact, it is uncomparable! Thanks for sharing your insight! It is a good reminder that indeed He has already made us over. Sometimes when I look at the woman in the mirror and see all the new wrinkles, the extra weight, the fading hair, I think, "hm, I need one of those makeovers." But God is so good, He doesn't see the flaws, just the beauty of Christ. Isn't that amazing? Debbie, Great, inspiring post! It's great to be visiting around blog world this evening. A nice diversion for me. Thanks for your prayers and words of encouragement concerning my Dad. We know that the prayers are what is keeping him going at this time. Blessings to you! Thanks for sharing the funny Christian cartoon strip. I'm gonna have to check them out. Also thanks for the beautiful song. I love music, as it truly moves my spirit! Yes, indeed. How true. How often we hold on to these things, and they get in the way. Thanks for this post... we do not have to work so hard to clean up our act... we never could do it on our own! I am praying for Gloria. May God bring complete healing to her body. Thanks for sharing the awesome song; so glad I stopped by your site!